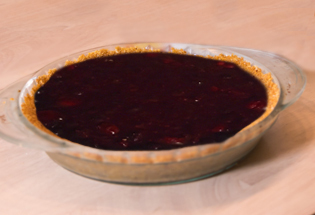 Finish off your holiday feast or any special occasion with this mixed berry pie, made with a cereal crust, and created to help you manage dessert in the Zone. 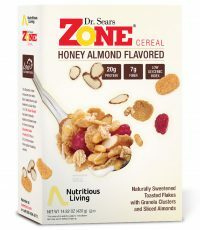 Grind 2½ cups of Zone Cereal in food processor. This will will leave you with about 1½ cups of finely ground cereal. In a bowl, mix the ground cereal, 5 Tbsp of butter and 1/4 cup sugar together. 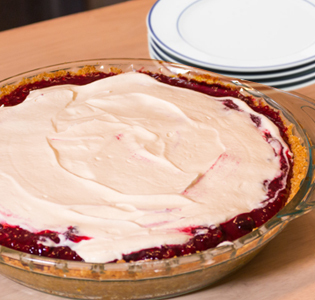 Add the crust to the pie dish. 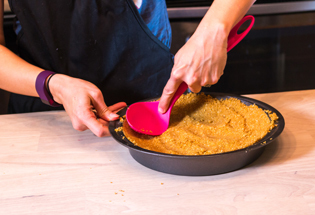 Tip: Use a measuring cup or spoon to press the mixture firmly to the dish. The crust must be firm or it will fall apart. There is expected to be some crumble because of the nature of it, but pressing will keep it more in tact. Put crust in freezer for 20 minutes. Then bake the pie crust at 375° for 8 minutes; then let cool. Mix 1/4 cup sugar, 1/4 cup water, 2 Tbsp flour, 1 Tbsp lemon juice and a dash of salt together in a sauce pan and and heat on medium until everything dissolves. Add berries and ginger to sauce pan and cook until it bubbles, about 3-5 minutes (until it starts to reduce). Tip: Be careful not to cook too long, as the the berries can burn and stick to the bottom of the pan. Let the berry mixture cool. 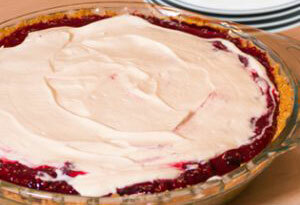 Add the cooled berry mixture to the cooled pie crust. Make whipped cream by pouring heavy cream, 2 Tbsp sugar and vanilla into a cold bowl and whisking until desired consistency. Add whipped cream to top of pie.